Have you been coming to Town Topic since its early days? Have you seen any celebrities? A Kansas City classic. An original greasy spoon, Town Topic is great for late-night coffee or crack-of-dawn breakfasts with presidential candidates. Hamburgers & chili are the main fare. I grew up on these Burgers. If I can go back tomorrow for my birthday I will. I went the day after my birthday. It just hit the spot. Excellent ate 4 double cheeseburgers and fries in less than 11 minutes. It was crowded so I got my food to go but it didn’t make it home. I love this place. I love this place, you can't go wrong with Town Topic. They make delicious patty melts, burgers, and everything else. Everyone I bring here loves it also!!! Great service, price, and atmosphere!!!! We can't stop craving Town Topic's chocolate milkshakes. Middle of the day, middle of the night, whenever. The hamburgers are the best, try a bowl of their Chili you'll love it! If you like a big meal then try the "TruckStop" guaranteed to fill you up! Best burger joint in town, open 24/7! 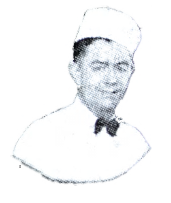 In 1937 Claude Sparks opened a little white diner at 2442 1/2 Broadway in downtown Kansas City and began selling hamburgers for 5 cents each. 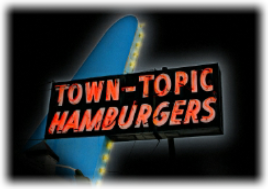 75 years later Town Topic Hamburgers has established itself as an iconic piece of Kansas City history. Come in and experience the great food and atmosphere that is the same today as it was back then at this authentic American diner. Our location that is Open 24 hours-7 days a week is in Downtown Kansas City in the Crossroads Arts District at 20th & Broadway. You can also visit our other two locations for breakfast and lunch.